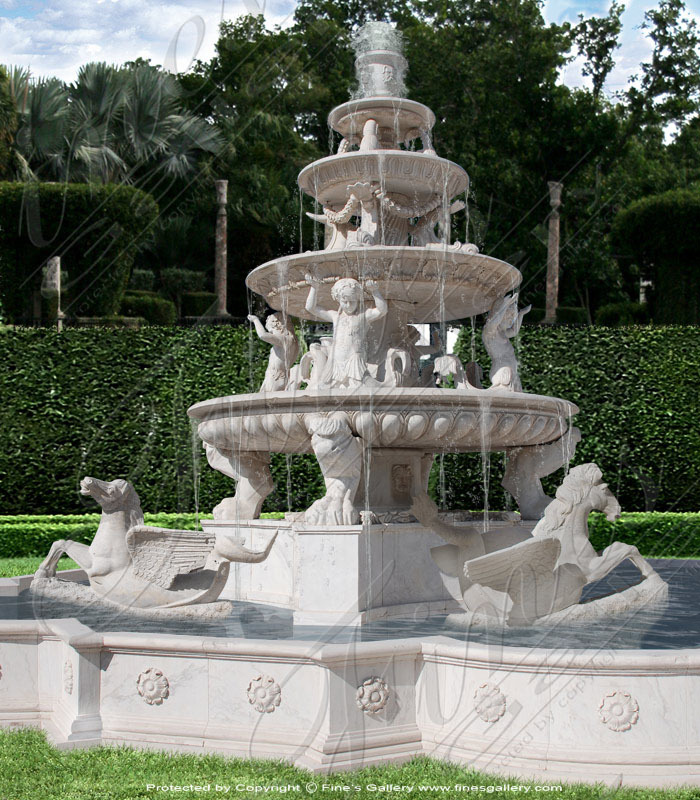 Villas of Rome Marble Fountains, hand carved from solid pure white marble. 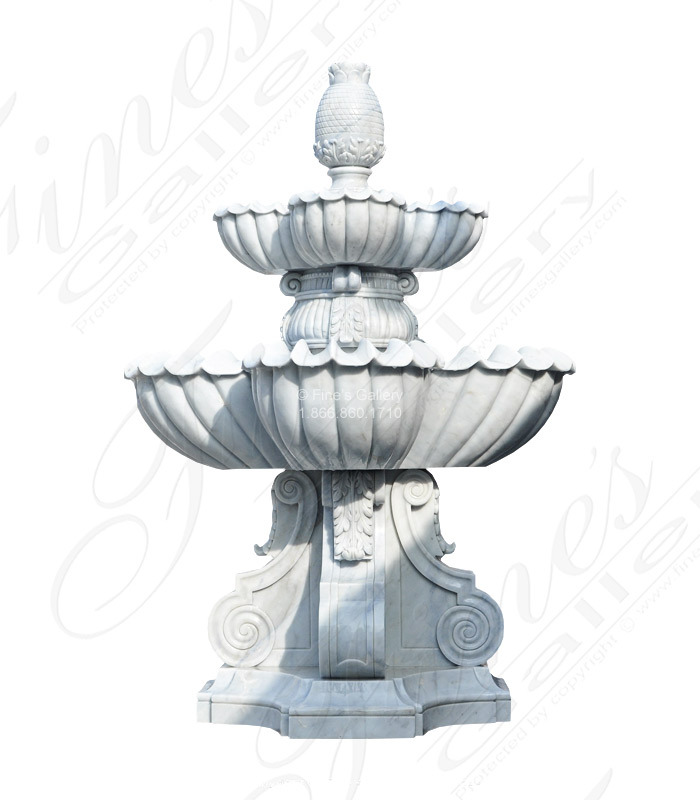 Features include accanthus leaf relief carved into the edge of each tier. 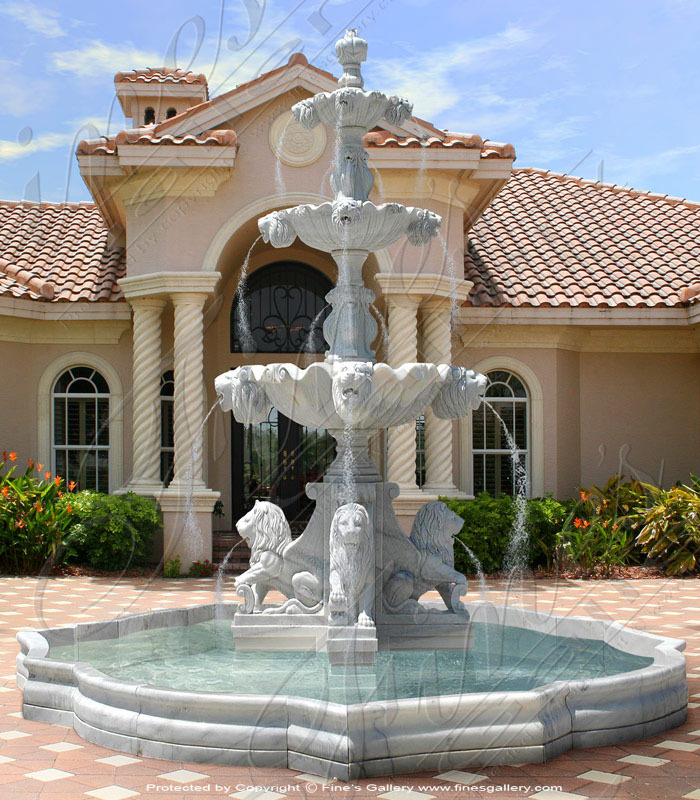 A magnificent ornate fountain feature indeed! Delivery to all US states and International. 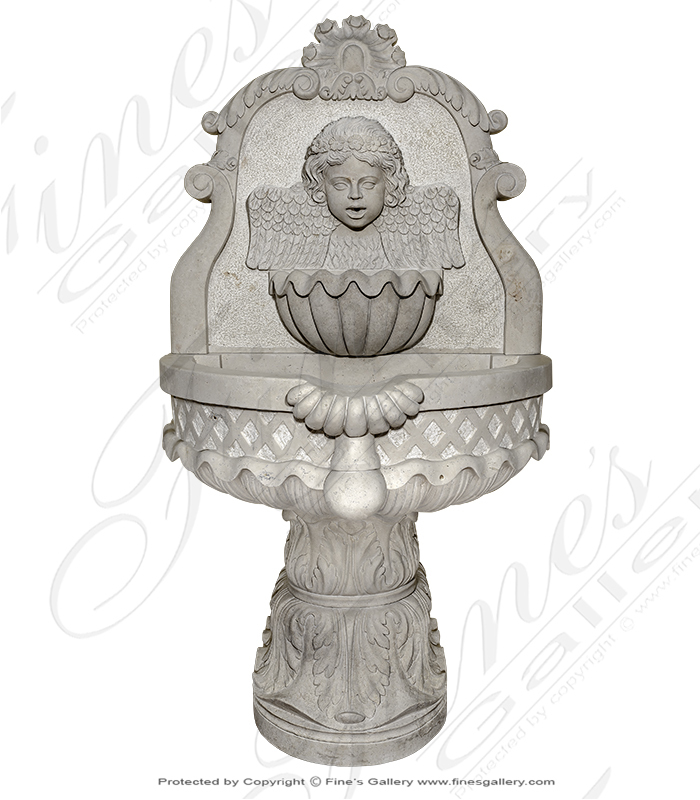 Classic Granite Garden Fountain XL - A carved granite outdoor water fountain, this stunning piece is very detailed and scaled impressively at just shy of 9 feet tall and 6 feet in diameter. Includes accanthus leaf carving detail throughout. Dimensions: H: 104" W: 71" D: 71" View Colors Call Us! Dimensions: H: 78" W: 78" D: 78" View Colors Call Us! 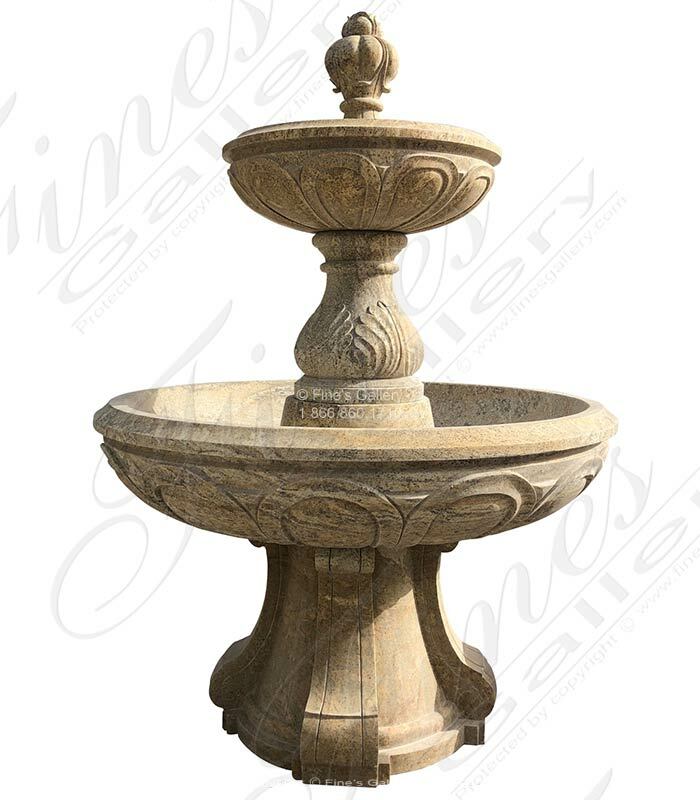 Carved from the Antique Golden Granite option, this Hamptons NY Granite Courtyard Fountain is perfect for a larger space that cannot quite use a pool. 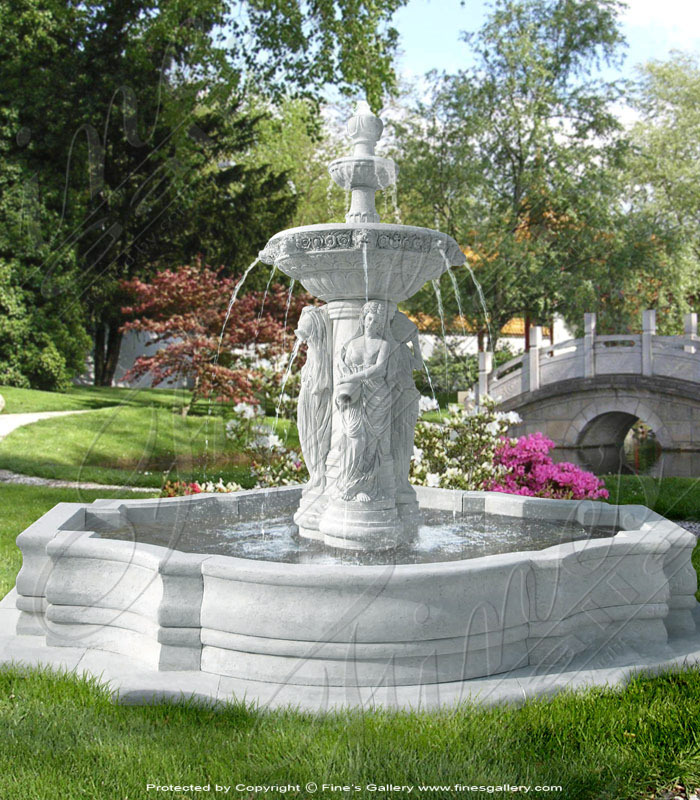 This bulky granite feature is commonly sold along with commercial grade stainless steel water jets. Dimensions: H: 90" W: 72" D: 72" View Colors Call Us! 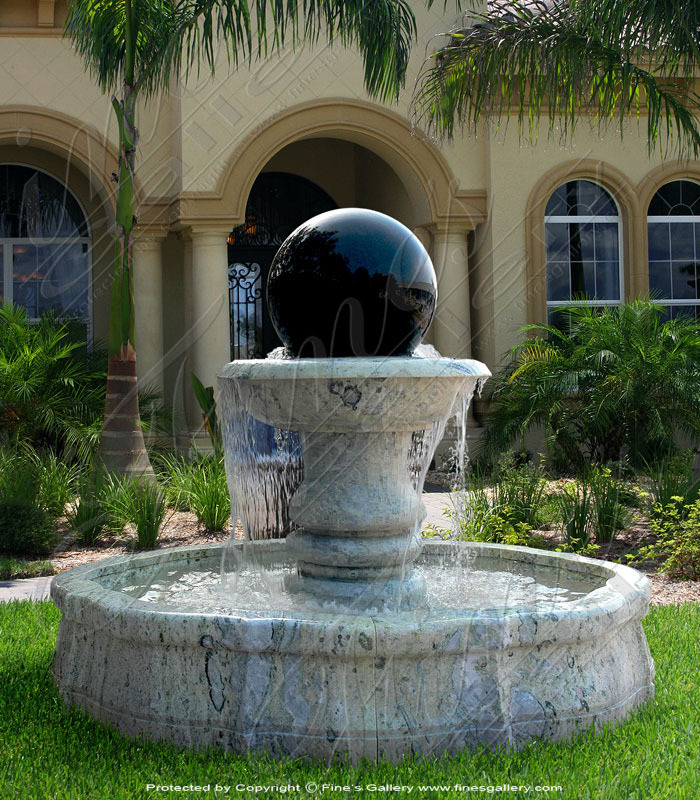 This black granite fountain is stunning, perfect for any exterior application. 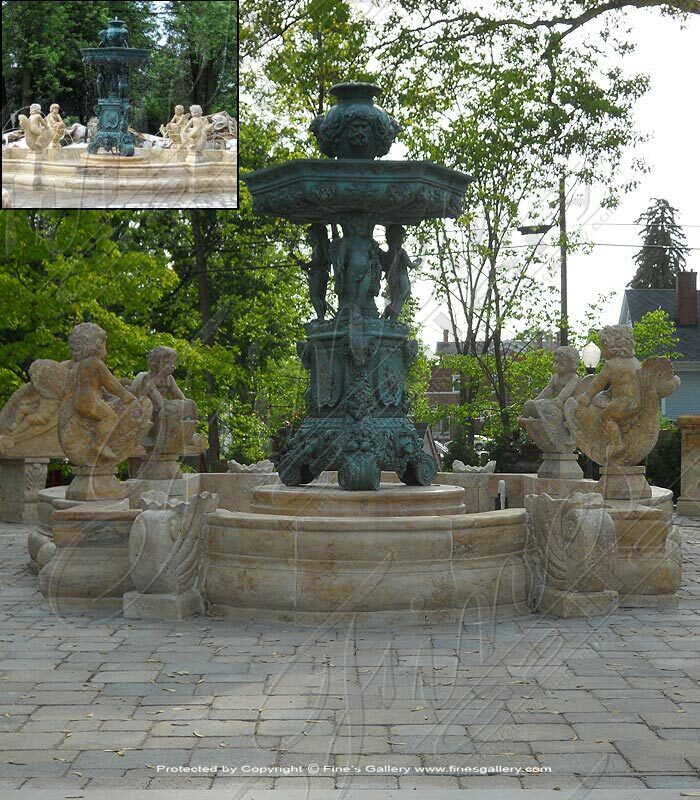 Water spouts from the lotus finial and overflows to larger catch basin below where the water recirculates from. Featuring egg and dart detail throughout. Dimensions: H: 54" W: 54" D: 54" View Colors Call Us! 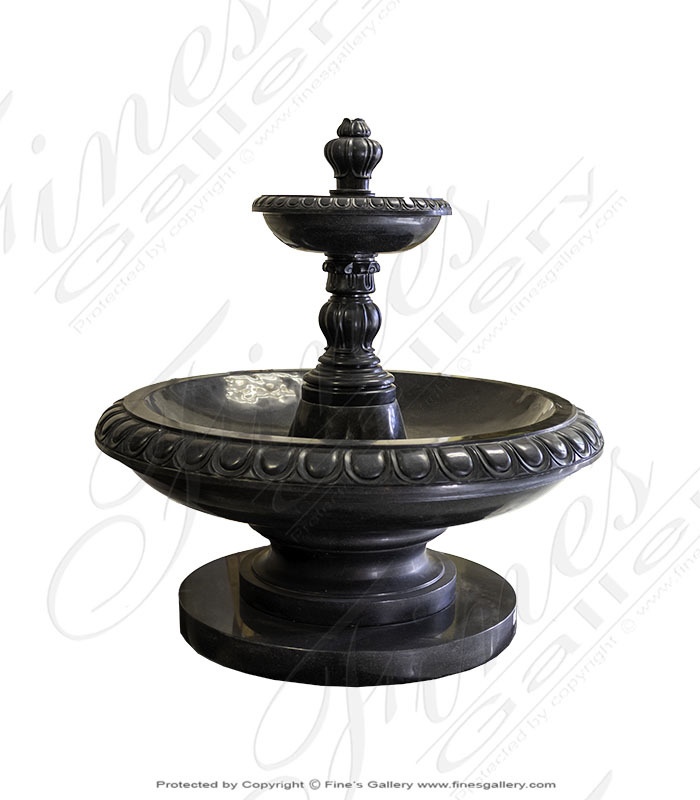 This elegant Granite Garden Fountain is carved from naturally quarried granite. 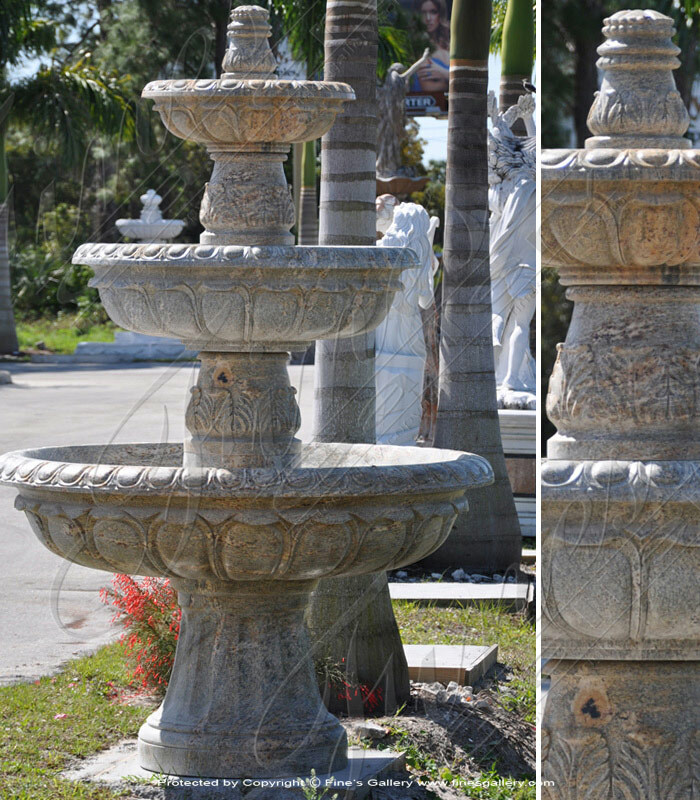 Featuring a finial spout and two basins sculpted with a sophisticated design and decorative accents. 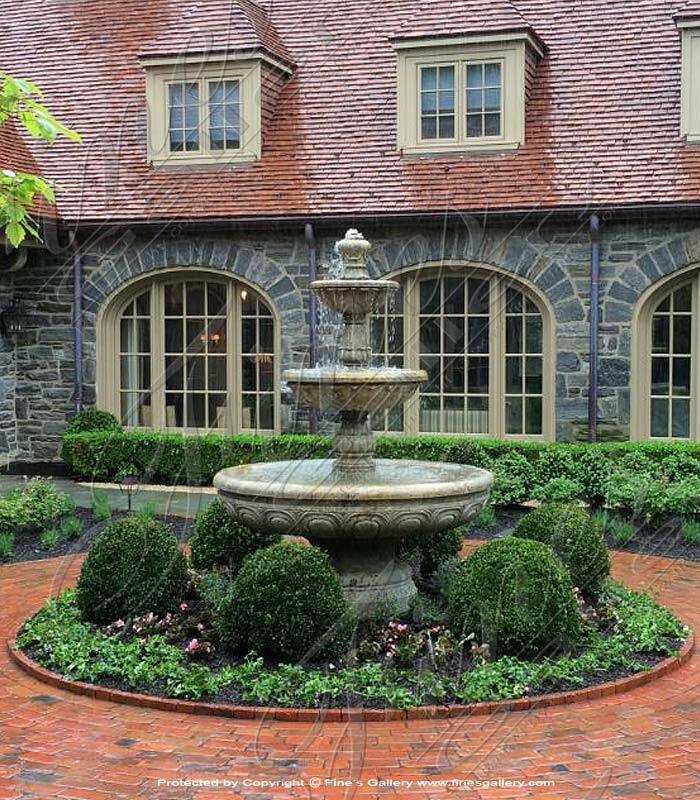 Perfect for a cold climate installation to withstand the harsh winter! Dimensions: H: 84" W: 60" D: 60" View Colors Call Us! 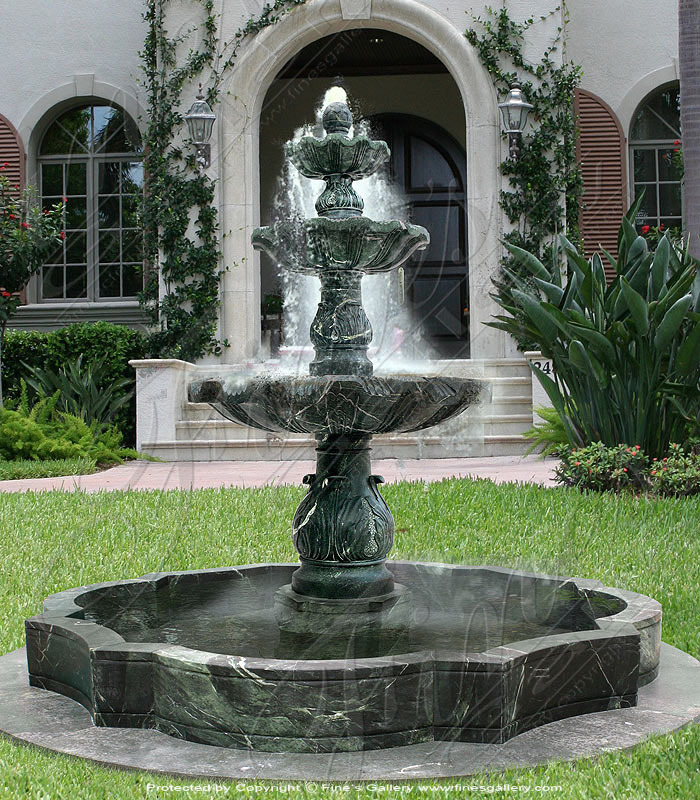 This Luxurious Granite Motor Court Fountain is regal beauty at its finest! 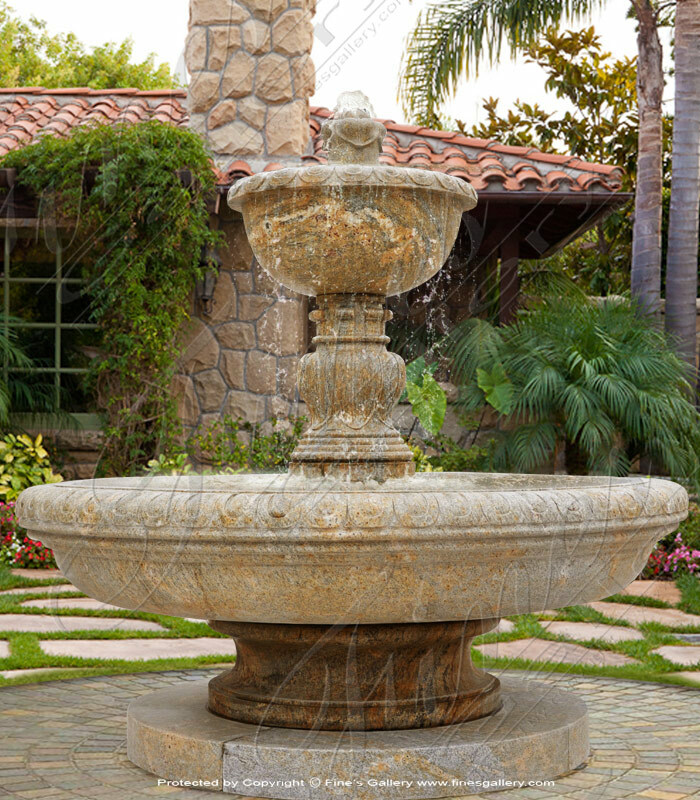 This elegant design features classical leaf and egg and dart accents complete with the natural beauty of granite stone and majestic waterfalls. In Production. Dimensions: H: 99" W: 67" D: 67" View Colors Call Us! 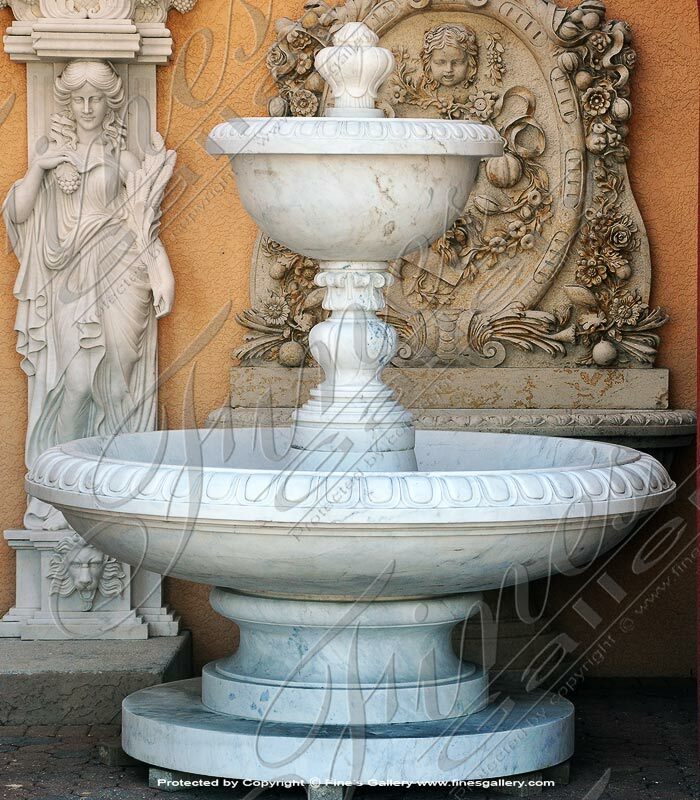 This lovely statuary white marble fountain is pure elegance! 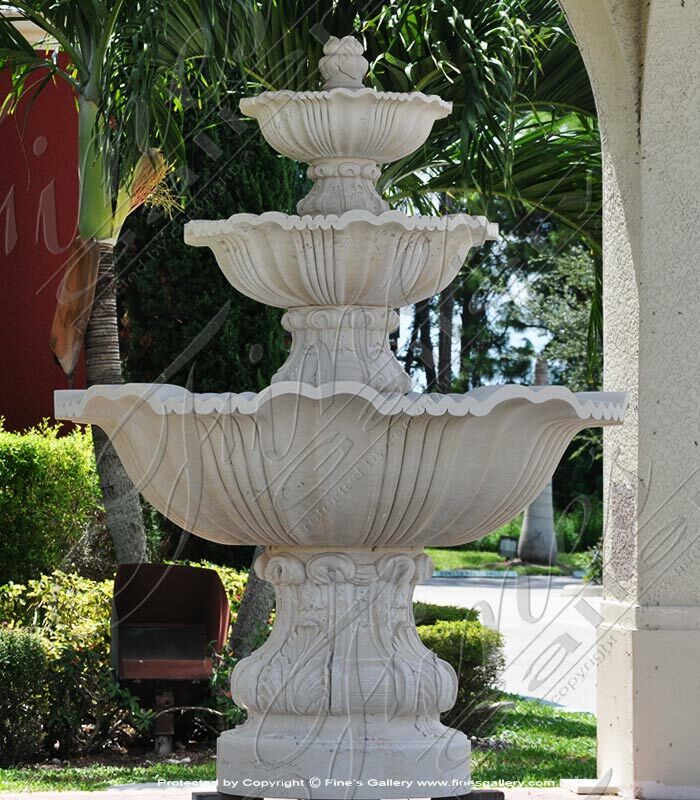 Sculpted with artistic beauty and delicately carved detail, its self contained design will create relaxing waterfalls for the perfect outdoor oasis. 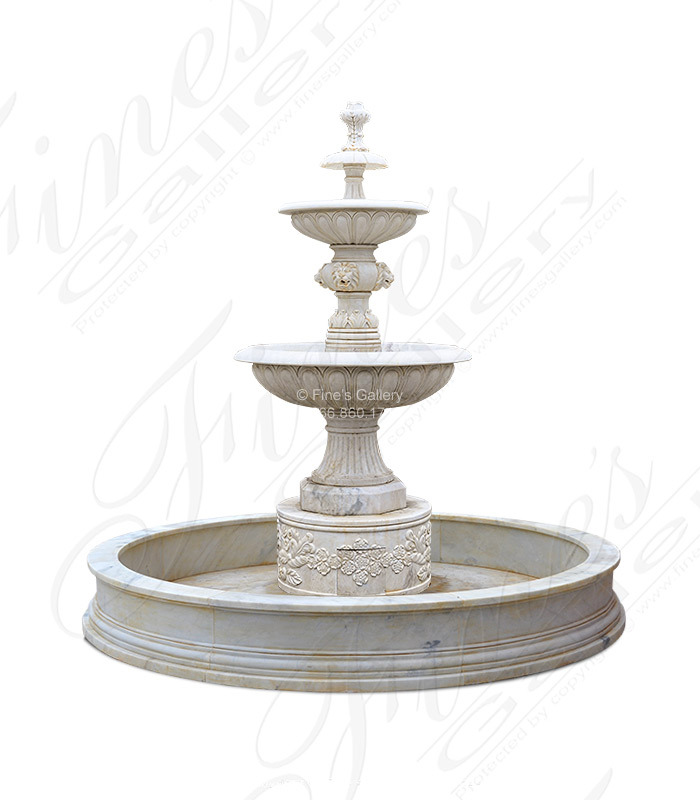 This traditional kashmir white granite fountain is self circulating, no catch basin required. 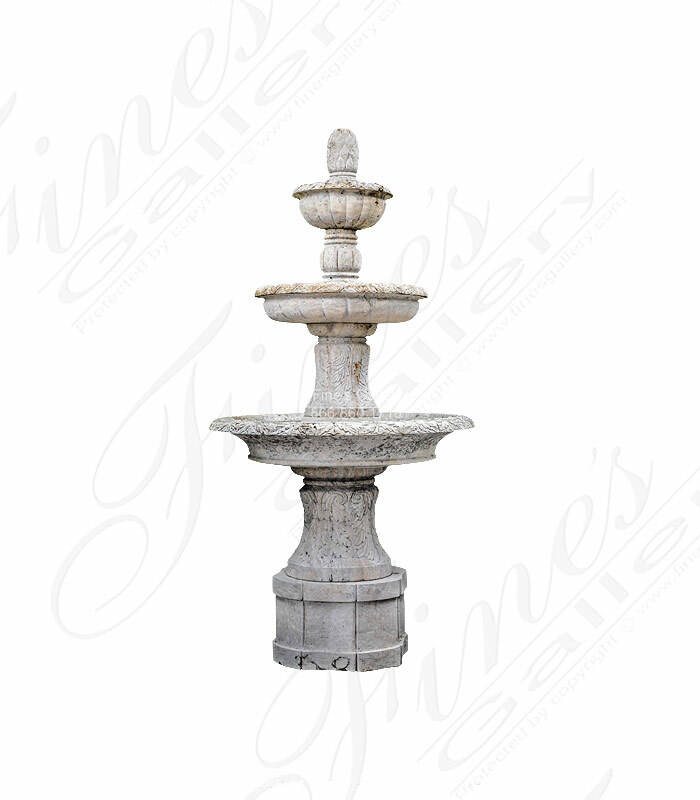 Originally designed for an 18th century italian courtyard and remastered for current date luxury estates. Dimensions: H: 75" W: 53" D: 53" View Colors Call Us! 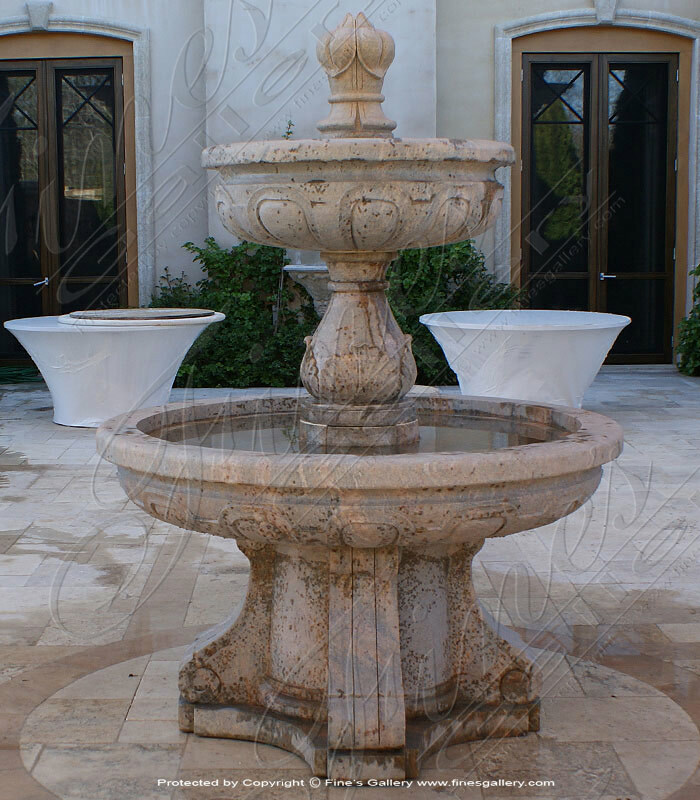 Tuscan Outdoor Marble Fountain. 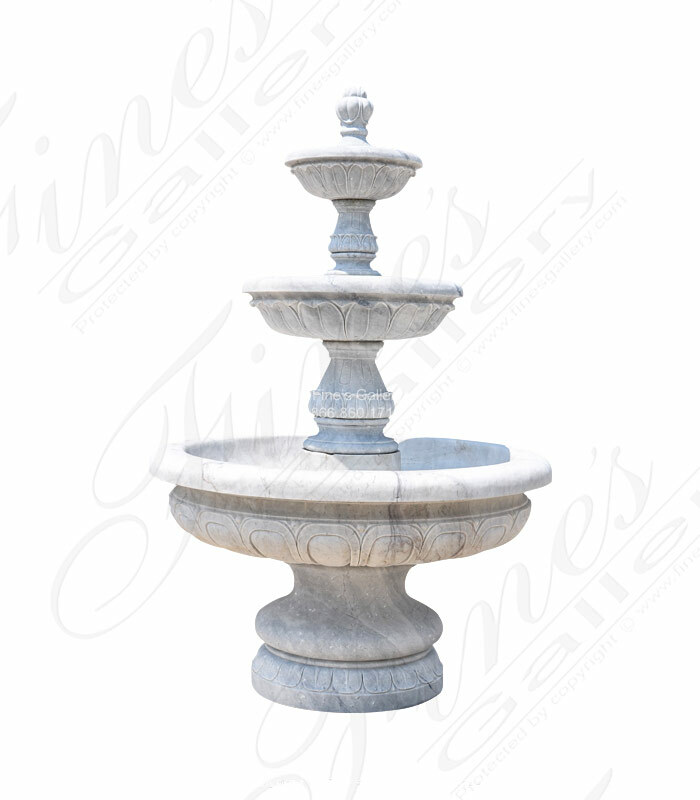 This solid white marble fountain is carved from a beautiful light white marble with light gray veins. 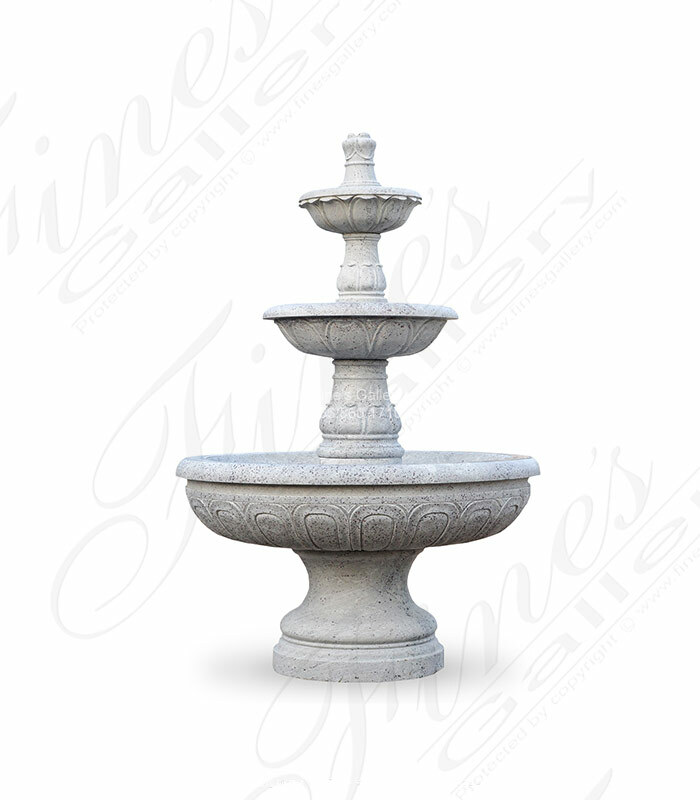 At just over eight feet tall this fountain is perfect for a circle drive or garden application. 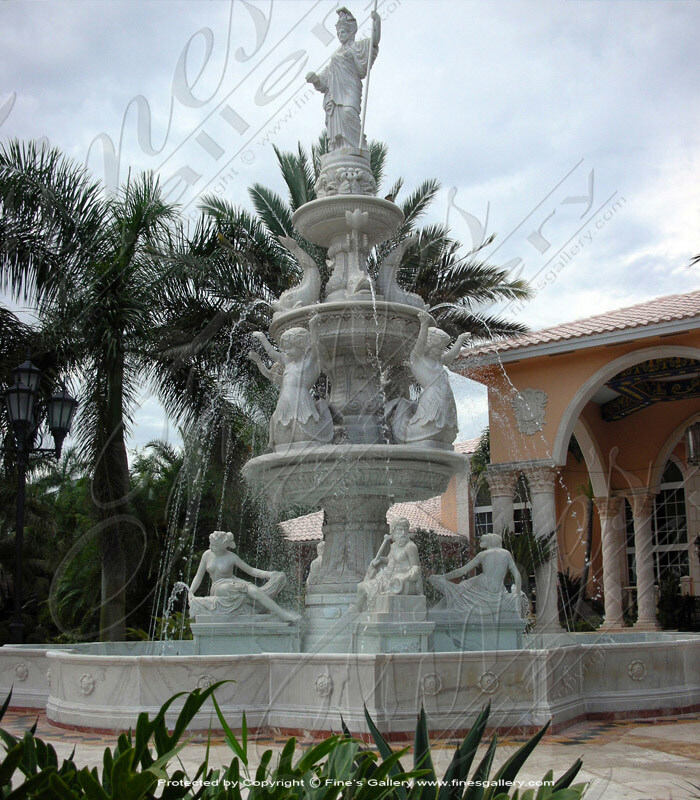 Beautiful waterfalls tumble down two tiers of white marble elegance. 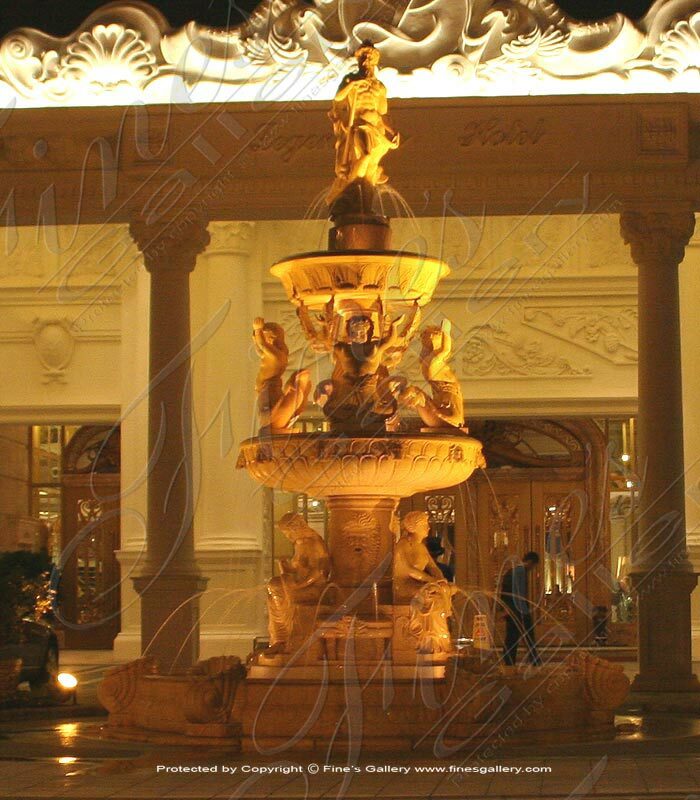 Finely hand carved with artistic detail, this fountain leaves lasting impressions of beauty and luxury. Contact us today for personal sales assistance. 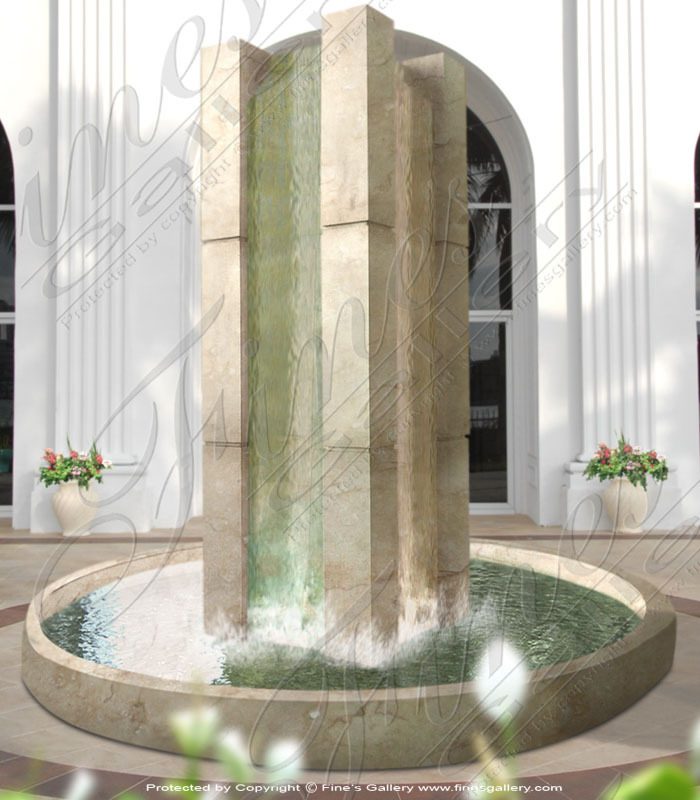 Dimensions: H: 96" W: 50" D: 50" View Colors Call Us! Dimensions: H: 94" W: 65" D: 65" View Colors Call Us! 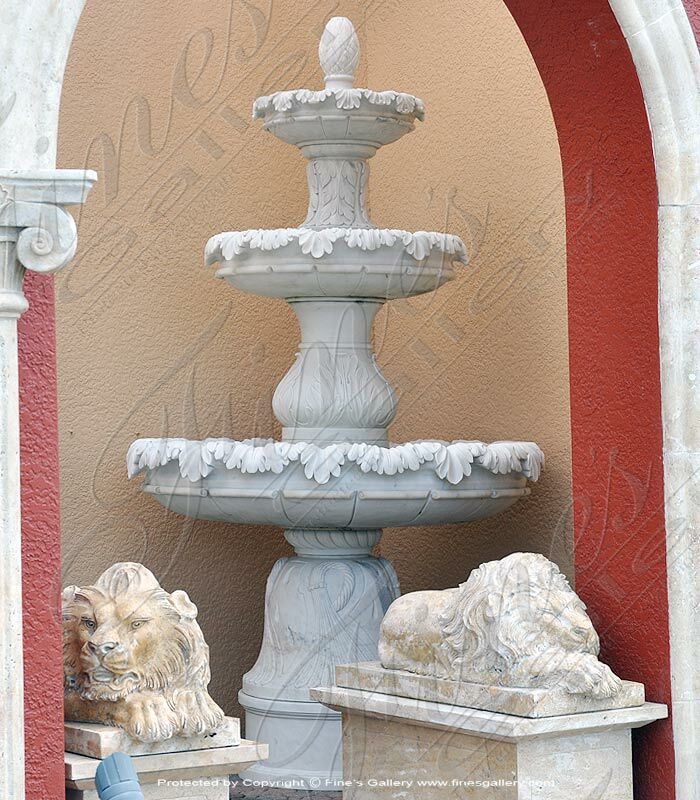 Antique White Italian Villa Style Fountain featuring four hand carved marble lion heads, traditional accanthus leaf and fleur de lis finial. 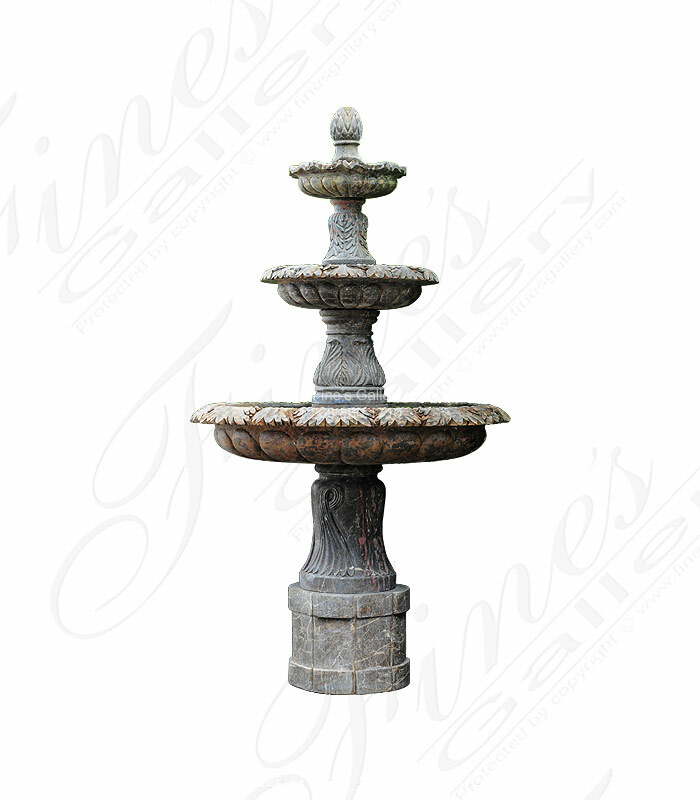 A large outdoor water fall aged finish perfect for old world garden. 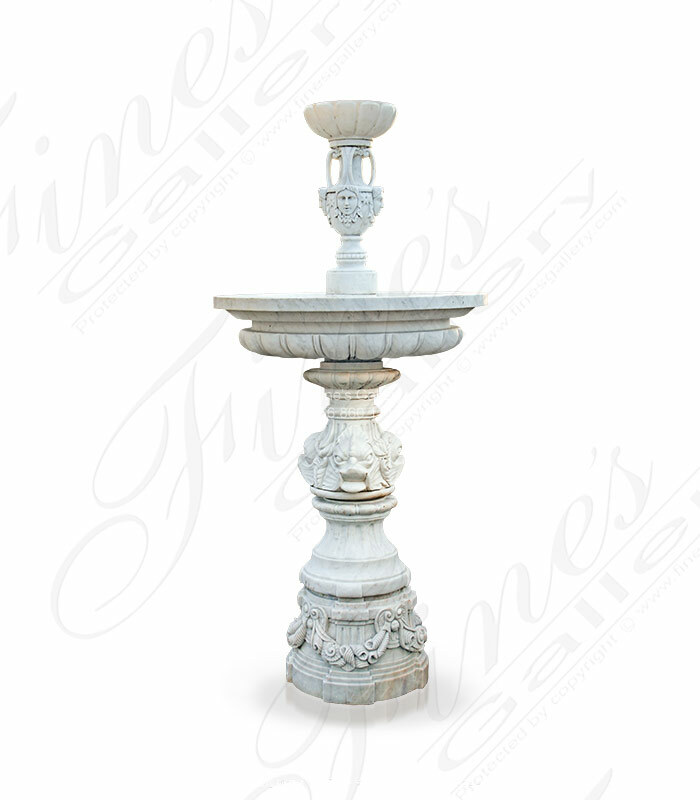 Ornate Base Sold Separately. Dimensions: H: 92" W: 55" D: 55" View Colors Call Us! Dimensions: H: 102" W: 54" D: 54" View Colors Call Us! Dimensions: H: 118" W: 54" D: 54" View Colors Call Us!